As Tottenham keeps on fighting to keep Gareth Bale in their ranks, London reports that the Roosters are also getting ready for the day after the Welshman’s transfer, and the hottest name at White Hart Lane is non-other than Luis Suárez. Reports in Turkey Claim that Israeli midfielder Yossi Benayoun, who was released from his contract with Chelsea, is now being offered €1.5 million a season by Trabzonspor. 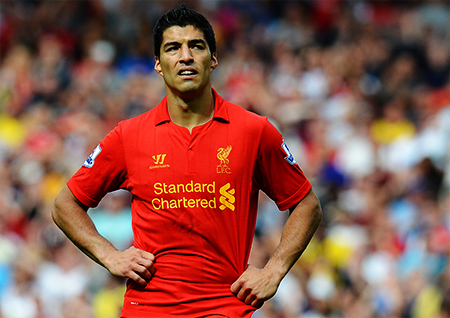 The Roosters are also getting ready for the day after the Welshman’s transfer with non-other than Luis Suárez. Corriere dello sport reports of a surprising new candidate from Manchester United, whos starting to lose their patience for Cesc Fàbregas, and are claimed to have approached Claudio Marchisio. The Juventus players’ price is expected to be around €25 million. Manchester United is also following Tottenham’s attempts to sign Roberto Soldado closely, since Valencia already marked Javier Hernández as their favorite candidate to replace him. The Sun claims that after rejecting Bayern Munichs offer of £40 million for David Luiz, José Mourinho’s club announced the Brazilian defender’s price is no less than £60 million. Sky Italy reports that Inter’s representatives met with Luiz Gustavo, the Brazilian midfielder rumored to leave Bayern Munich, yesterday. Inter is also very close to closing Wallace’s transfer deal from Chelsea. The 19 year old right-wing defender is reportedly not a part of José Mourinho’s game plans. Alexis Sánchez, who was a candidate for Napoli, declared he wishes to stay in Barcelona: “I believe in my skills, but I know I have to fight to win my place in the starting line-up”. Meanwhile, Napoli reached an agreement with Jackson Martínez, Porto’s forward, but the club still insists they will not let the Colombian go. Juventus CEO, Giuseppe Marotta, declared that after signing Carlos Tévez and Fernando Llorente the old lady will try to sell one of the 6 forwards who are now in her roster. Most likely to lose his place is Fabio Quagliarella, in whom many English clubs showed interest. The Daily Mirror claims Joey Barton offered himself to Everton, while making clear he will be willing to cut his salary by half in order to play in his childhood dream club. Liverpool has renewed their interest in Schalke 04’s Greek defender, Kyriakos Papadopoulos, who’s estimated worth is £13 million. Canadian midfielder Atiba Hutchinson, who finished his contract with PSV, joined Be?ikta?. Bordeaux beat Sevilla, Villarreal and Sunderland to the punch, and signed Argentinian defender Lucas Orban for 4 seasons.